Painter Laben John (above) won the Connect UK Art competition for a portrait of the Queen conducted to commemorate her 50th year on the throne. 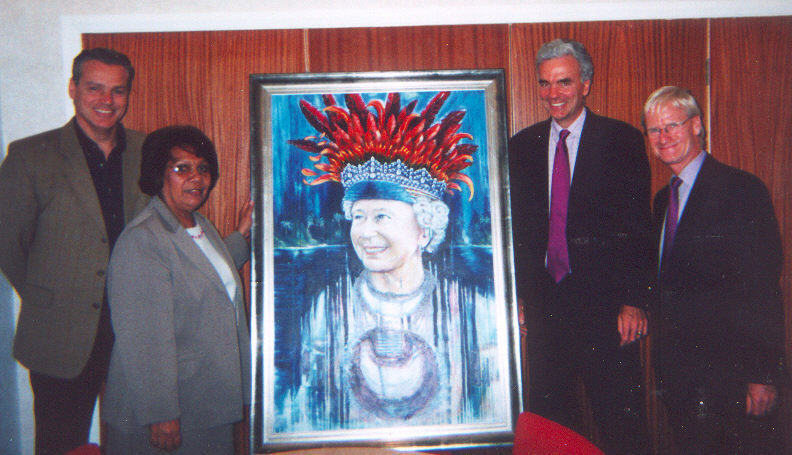 Laben's portrait (above), was presented to the Queen by the PNG High Commissioner to the UK, Ms Jean Kekedo on 16 July 2002. To celebrate and mark the Golden Jubilee of Her Majesty Queen Elizabeth II, a Fine Arts Exhibition, entitled ''20 Portraits and other Works'', was held in June 2002 at the Holiday Inn. Each of the represented Papua New Guinean Artists displayed a portrait of the Queen, specially done for this exhibition. One of the Portraits was selected to be sent as a gift to the Queen from the artists of Papua New Guinea to commemorate her Golden Jubilee. 6. Ms Wendy Harris, Head of Visual Arts and Deputy Principal, Port Moresby International School. was a 'private viewing' event (invited guests only) followed by a public viewing on the 5th of June. All works were available for sale. We also exhibited the paintings at the PNG National Museum and Art Gallery later in June. The winning portrait was presented to Her Majesty by the PNG High Commissioner to the UK. And the runner-up portrait was presented to the PNG High Commission in London by Rio Tinto. The exhibition was opened by His Excellency Sir Silas Atopare, Governor General of Papua New Guinea. Scanned images of the portraits will shortly be available on this website.